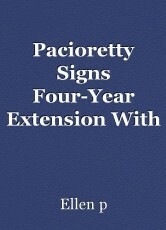 (Above) Max Pacioretty signs four-year deal with Vegas. After being acquired by the Vegas Golden Knights two days ago, Max Pacioretty has now signed a four-year, $28 million contract extension with the team. "He, (Pacioretty), can score," said Vegas's general manager, George McPhee. The Canadiens traded Pacioretty on Sunday to the Golden Knights for Tomas Tartar, prospect, Nick Suzuki, and a second round draft pick in 2019. Apparently, the Knights have been targeting Pacioretty since the NHL Entry Draft in June. Pacioretty has been the Canadien's captain since September 2015. Pacioretty scored 17 goals and had 20 assists in 64 games this past season. Unfortunately, Pacioretty had to miss the last 18 games of the season because of a knee injury. In his career, Pacioretty has 448 points,(228 goals, 222 assists), in 626 games. Pacioretty has had five 30 goal seasons in his career. Pacioretty was drafted by the Canadiens 22nd overall in 2007.